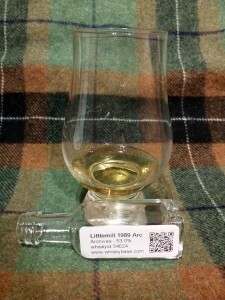 The nose is alive and kicking, it doesn’t seem like a 24-year-old dram at the first glance. Definitely not a first-fill cask, which emphasises the distillery’s character. A wee bit spirity, freshly mown grass, hay, clove, white pepper, real bourbon vanilla pods, hints of citrus, apples, malt and a slightly dusty note in the background. Adding an espresso spoon of water brings out the dusty and malty notes and tames the alcohol. The palate matches the nose. An initial punch of alcohol followed by lemon rind, grapefruit juice and fresh grass notes. With a bit of water it is more approachable but the general grassy, green, herbal profile doesn’t change that much. Some menthol and camphor. Do I detect some faint berries in the background? Something like blackcurrants and green kiwi perhaps. Very little sweetness, pretty dry actually. The finish is oily at first, slightly sweet and grassy again with hints of clove and hay. As it dries down oak notes start to appear. Medium long. With some water added I even get the impression of parrafin or motor oil (pleasantly surprising, though!). Littlemill. The “lost” Lowlands distillery which seems to get more and more attention and traction these days. Rightfully so, this particular example has matured really well, preserving the light and fragrant, even grassy “lowland style”*. Not my most preferred style of whisky, but I can appreciate its quality. Give this specimen some water and time and you’ll be rewarded. *Post-publishing correction: @Pandemoniumd01 pointed out to me on twitter that Littlemill didn’t use triple distillation, as I had originally stated. I did check that statement prior to publishing, but I guess I used a source which, too, was wrong.